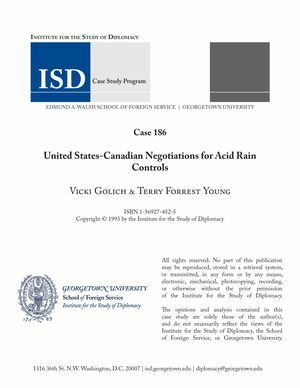 This case study uses the U.S.-Canada acid rain dispute of the 1980s to draw important lessons for students, scholars, and practitioners of international relations. It explains factors common to most international conflicts, such as an asymmetrical distribution of effects, the asymmetrical distribution of power, the absence of a supranational authority, and disparate political cultures. The study then uses the acid rain negotiations to identify additional factors found in nearly all environmental disputes: commonly held resource characteristics, technical complexity, and scientific or economic uncertainty. This case distills these factors into an engaging narrative of U.S. and Canadian environmental policies of the 1980s.